The SharePoint Site User Directory web part displays a list of all users and groups that have the appropriate permissions to access a SharePoint site. A full suite of display options allow users to view user accounts and groups alphabetically, by organizational unit, by site permissions, or by recent activity in SharePoint (activity within a five minute timeframe). Show whether a user has been active in SharePoint within a 5-minute timeframe. ...... been active in SharePoint, and enables users to send an email notification to that account. 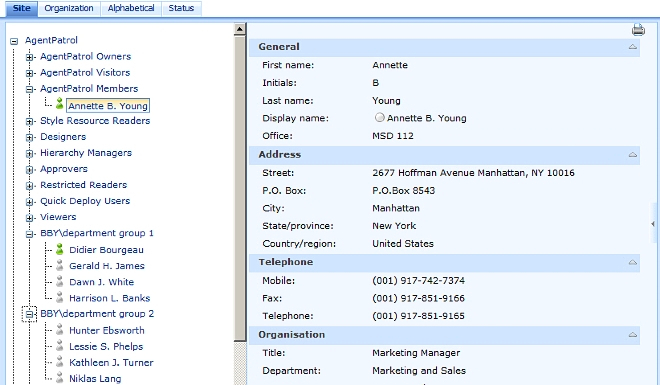 Users can also search for user accounts or groups by account or by other metadata. IT administrators also have complete control of how accounts are displayed, including options to add, remove, or rename AD account properties as well as configure and organize AD properties in tabs above user profile information. Moreover, all profiles are displayed in a print friendly window, allowing for effortless printing of profile and contact information. Qweas is providing links to SharePoint Site User Directory 1.1.119 as a courtesy, and makes no representations regarding SharePoint Site User Directory or any other applications or any information related thereto. Any questions, complaints or claims regarding this application SharePoint Site User Directory 1.1.119 must be directed to the appropriate software vendor. You may click the publisher link of SharePoint Site User Directory on the top of this page to get more details about the vendor.